Following the finger snap that wiped out half the universe in Avengers: Infinity War, Earth’s Mightiest Heroes will be seriously low on numbers in Avengers: Endgame. There is an upside to this, though, as fans will get to see things come full circle as the original six Avengers reunite – alongside a few new friends – to do whatever it takes to defeat Thanos and set things right. Someone it’s definitely good to see back is Clint Barton AKA Hawkeye. Or, as he’ll go by in Endgame, Ronin. Jeremy Renner hasn’t been seen as the Avenging Archer since 2016’s Captain America: Civil War, and even on that occasion, the team were divided over the Sokovia Accords conflict. This will be the first time the OG heroes have been together since 2015’s Avengers: Age of Ultron, then. And now, Renner’s given us a taste of the gang reunited in a photo he shared on his Instagram account. 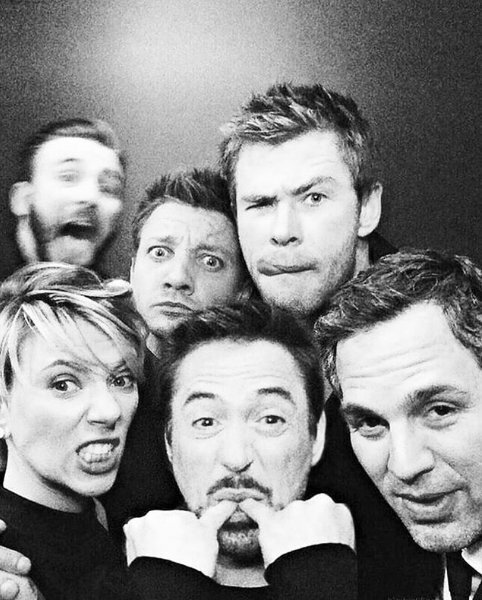 As you can see below, it’s black and white snap that features Jeremy and his friends pulling faces and reminding us why we loved them so much in 2012’s The Avengers. Yes, somehow this bunch of goofballs are going to have to find a way to best the genocidal purple maniac in Endgame and resurrect those who turned to dust. Sure, Rocket, War Machine, Ant-Man, Nebula and, most notably, Captain Marvel will lend a hand, but we’ve been told to expect the movie to focus on the six heroes who started it all. Now, if I was a conspiracy theorist, I’d point out that Chris Evans’ blurry placement at the back of this photo could be a clue that Captain America dies in Avengers: Endgame. But we’ll find out for sure when April 26th rolls around.